Picture Reduce Studio is easy-to-use software, allowing you to reduce picture size and resize images in batch mode. You can reduce pictures to different size by compressing or resizing options. Picture Reduce Studio is your best choice. Stop handling pictures one by one any more! Get Picture Reduce Studio Today! Easily reduce your pictures in batch mode. Picture Reduce Studio support imports popular image formats : BMP, JPEG, PNG, GIF ,WMF etc. Easy to reduce picture file size & resize picture files. ...... Get Picture Reduce Studio Today! Easily reduce your pictures in batch mode. 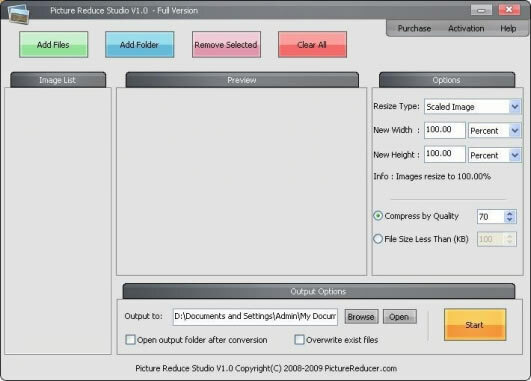 Picture Reduce Studio is an easy-to-use software, allowing you to reduce picture size and resize images in batch mode. You can reduce pictures to different size by compressing or resizing options. * Support imports popular image formats : BMP, JPEG, PNG, GIF ,WMF etc. Qweas is providing links to Picture Reduce Studio 3.0.1 as a courtesy, and makes no representations regarding Picture Reduce Studio or any other applications or any information related thereto. Any questions, complaints or claims regarding this application Picture Reduce Studio 3.0.1 must be directed to the appropriate software vendor. You may click the publisher link of Picture Reduce Studio on the top of this page to get more details about the vendor.